Arsenal forward Theo Walcott is having a medical at Everton before a proposed move worth more than £20m. It seems the England international, 28, has played his last game for the Gunners, whom he joined from Southampton 12 years ago. Everton's offer is expected to fend off rivals for his signature, including Southampton. Walcott is also enticed by the prospect of Toffees manager Sam Allardyce helping to reignite his career. He has scored 108 goals in 397 appearances for Arsenal but has fallen out of favour with manager Arsene Wenger. However, it is unlikely Arsenal would recruit all three players, and a source close to Mkhitaryan has told the BBC no agreement is close. 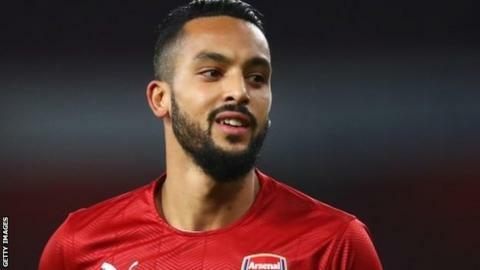 Allardyce has said Walcott would be a "fantastic addition" who would offer "goalscoring threat". Meanwhile, the Gunners have offered a new deal to England midfielder Jack Wilshere. The offer is worth less than his current deal but is heavily incentivised. Walcott is not a done deal yet - there are still some hurdles to overcome before the deal can be completed. Everton run a lengthy medical and therefore it makes sense to get it started while negotiations are ongoing so that if/when agreement is reached the deal can be completed, rather than having to then start the medical. An outcome is expected in the next 24 hours.